A guide to Scotland's best walks. 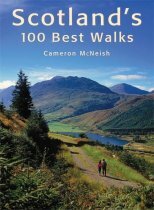 This is a superb collection of the 100 best walks in Scotland, chosen by thecountrys foremost hillwalker, writer and broadcaster, Cameron McNeish.From the Borders to the northern islands of Orkney and Shetland, here arenothing but the best walking routes compiled by Cameron during his lifetime ofwalking in Scotland. From easy low-level walks along forest trails and coastlines,to testing mountain tracks on airy ridges, there is something here for everyone.The routes are illustrated by distinctive hill-shaded maps and the photographyof Colin Baxter. Detailed and anecdotal walk descriptions are accompanied byroute summaries, walking times, distances and grading.This is a magnificent guide for anyone who enjoys the simple pleasures ofwalking and a fascinating read for those with an interest in rural Scotland.